Hunter College has been designated as one of 11 Capstone Colleges in the United States by the Howard Hughes Medical Institute as a result of long-term funding to PI Shirley Raps. Images From Diana Bratu's lab, taken by Dr. Irina Catrina are featured in Cell's Journal Picture Show, called Reproduction. Hunter College is one of only nine institutions of higher education in the country to offer an interdisciplinary program in quantitative biology. Students majoring in Biology, Chemistry, Computer Science, Mathematics or Statistics can add a quantitative biology concentration to their major. Among the many benefits of this innovative program are access to competitive scholarships, small classes, training by a multidisciplinary team of research scientists and dedicated academics, individual mentoring, the opportunity to participate in research conducted at Hunter and nationally, topnotch preparation for graduate studies and for scientific careers in this new frontier. Summer Internship, Graduate School, Post Bac. Experiences, Medical School, M.D./Ph.D. Programs, Postdoctoral Fellowships. Are you interested in a summer internship or perhaps seeking support for graduate school, medical school, an M.D./Ph.D. degree program or a postdoctoral research experience? 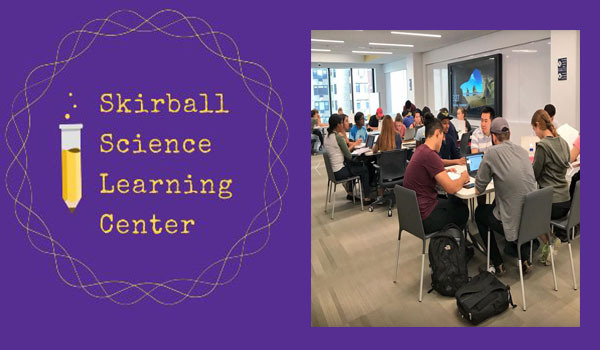 The Skirball Science Learning Center (SSLC) provides comprehensive assistance to all Hunter College students in all areas of the natural sciences and technology. Hunter College is located at the intersection of 68th Street and Lexington ave. in Manhattan's Upper East Side. The Biology department occupies the 8th and 9th floors of the Hunter North building. The mission of the Department of Biological Sciences parallels that of Hunter College: to provide a quality education for our undergraduate and graduate students, enabling them to participate productively in their chosen pursuits. The MARC Program is Accepting Applications Now!! The MARC Programs at Hunter College is supported by the National Institutes of Health (NIH) and are intended to encourage talented undergraduate minority students to pursue a career in research and science. Students in both programs receive a scholarship and financial support for conducting research throughout the academic year in a Hunter College laboratory. For more information click here. MGSN is a student-run network of graduate students, medical students, and postdocs that aims to retain and increase the number of underrepresented minority students pursuing advanced degrees in STEM and medical fields. Interested in Pursuing a Graduate Degree?? Q&A Event on the Graduate School Process? The BP-ENDURE program is designed to encourage and prepare undergraduate students from diverse backgrounds to enter into and succeed in PhD programs in the neurosciences. The program has partnered with other institutions to enrich students’ experiences. Throughout the year, students conduct research at Hunter or NYU. During the summer, students are placed at either NYU, Brown University, University of Michigan, or Vanderbilt University. For more program and application details please visit our website, www.bpendure.org.